This is a beautiful race that you don’t want to miss. Be sure to check out this video HERE, then register below. Swim Course: The 1.5K Olympic swim course takes place in the 200 acre pond that is the centerpiece of Lums Pond State Park. Averaging about 10′ in depth and being somewhat long and narrow; this creates a nice, calm swim experience that should be in the low to mid 70’s on race day. A preliminary water temperature will be posted on the website the Friday evening prior to the event. The swim start and finish area are wide open which creates great opportunities for spectating. All athletes start by swimming parallel to shore for their first 250 meters or so. The Sprint and Olympic courses are both rectangular with orange sighting buoys located about every 75 meters and yellow triangles for turns. Run Course: The run is beautiful with a heavily forested mix of lake views, single track and graveled walking paths. Lums Pond offers some amazing running and you’ll find yourself back here logging some miles after the race. These shaded trails will be nice and cool in the morning and will have aid stations about every mile serving ice water and Gatorade. Olympic athletes will do two (2) loops of the 5k run course to get their 10k in. Once you finish the race you’ll be able to spend some time at the lake talking to old friends and making new ones with plenty of post race food and music. Swim Course: The 750 meter Olympic swim course takes place in the 200 acre pond that is the centerpiece of Lums Pond State Park. Averaging about 10′ in depth and being somewhat long and narrow; this creates a nice, calm swim experience that should be in the low to mid 70’s on race day. A preliminary water temperature will be posted on the website the Friday evening prior to the event. The swim start and finish area are wide open which creates great opportunities for spectating. All athletes start by swimming parallel to shore for their first 250 meters or so. The Sprint and Olympic courses are both rectangular with orange sighting buoys located about every 75 meters and yellow triangles for turns. Bike Course: The bike is flat and fast. After taking a right to exit the park, Sprint athletes will do 1 x 6.7 mile loop around the park. Consisting of all right hands turns and great pavement, this race feels like a NASCAR track with aerobars. When you arrive back at the park entrance you’ll turn right to head back to the race site for T2 making the bike course just over 10 miles. 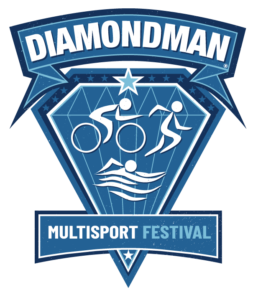 Duathlon: The Duathlon will start with a 1 mile run and will start at 8am with the first wave of the Triathlon. The first run will start near the finish line and will be an out and back run to end at the Transition Area where the swimmers come in. The Bike and Run courses are the same as the Sprint Triathlon. Location: Lums Pond State Park (Race Site) You do NOT have to pay to enter the park for PPU or the race!